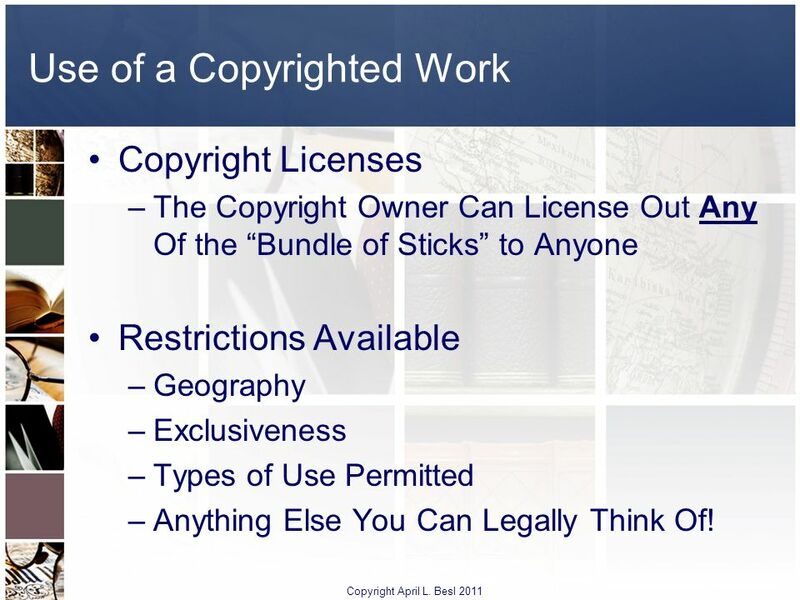 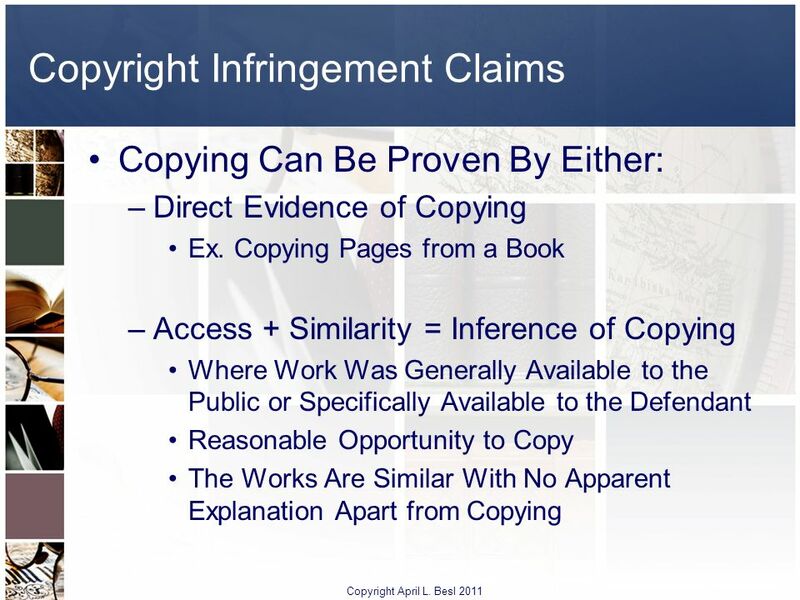 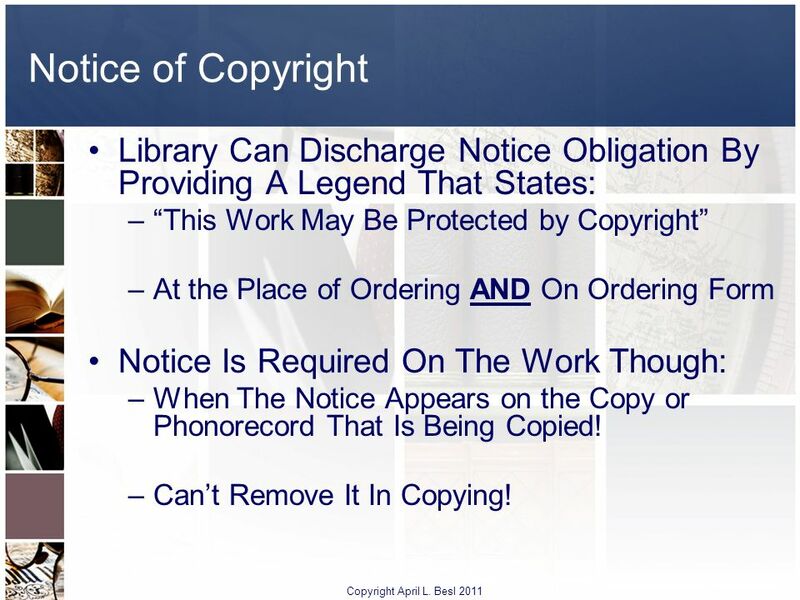 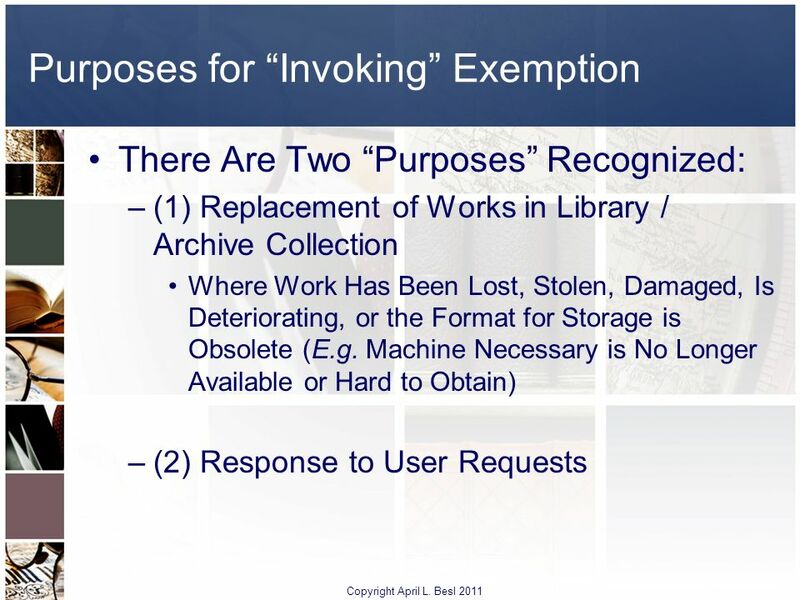 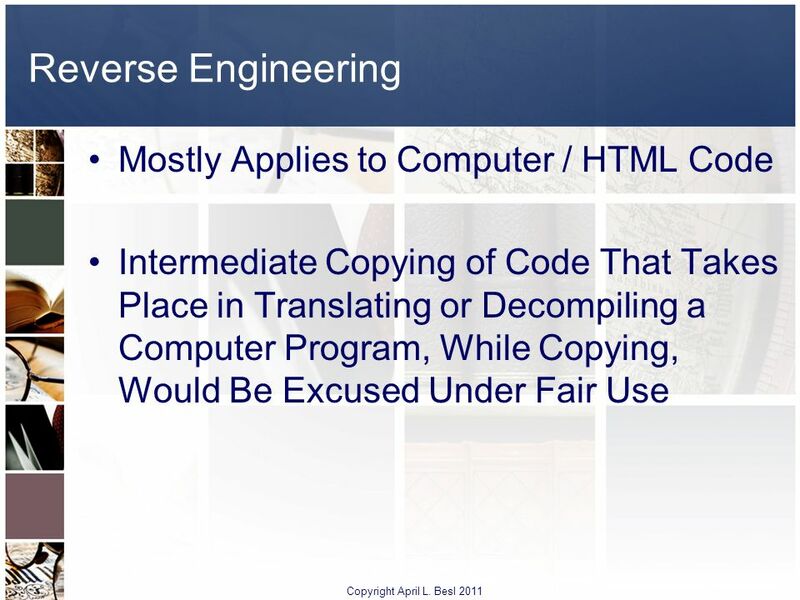 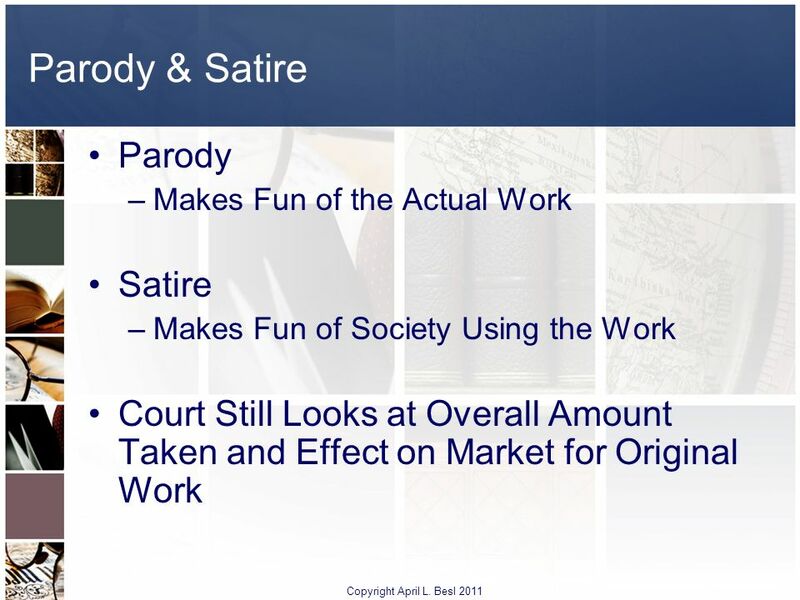 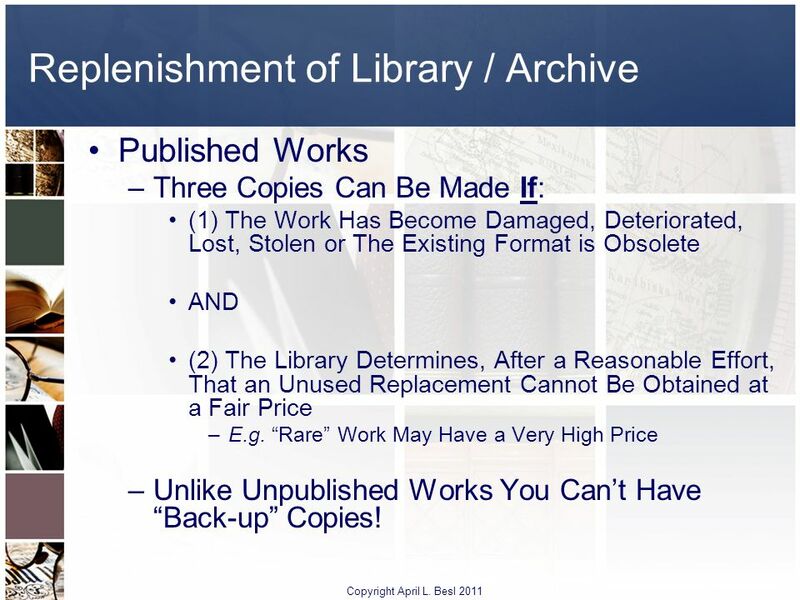 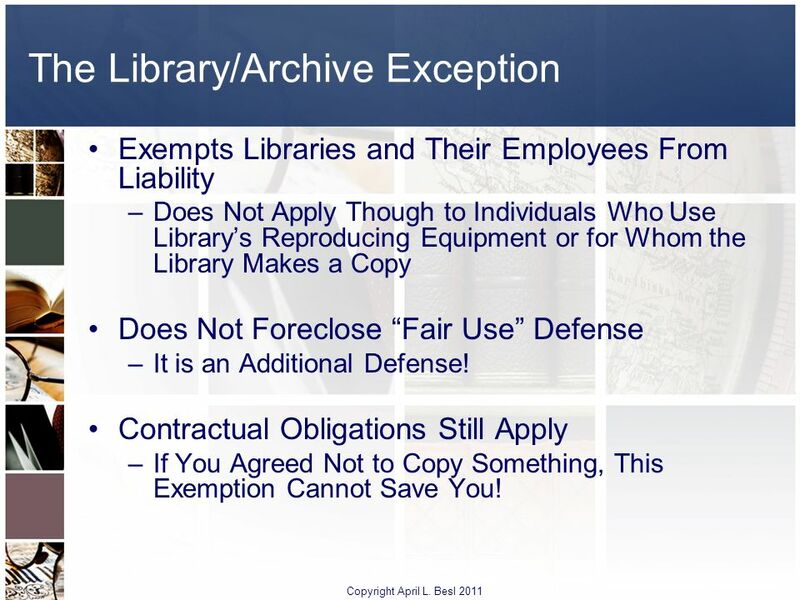 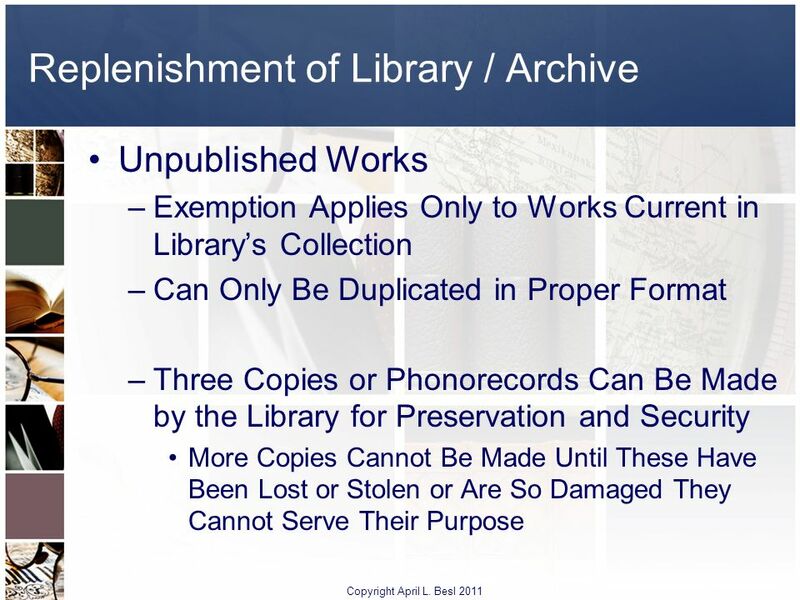 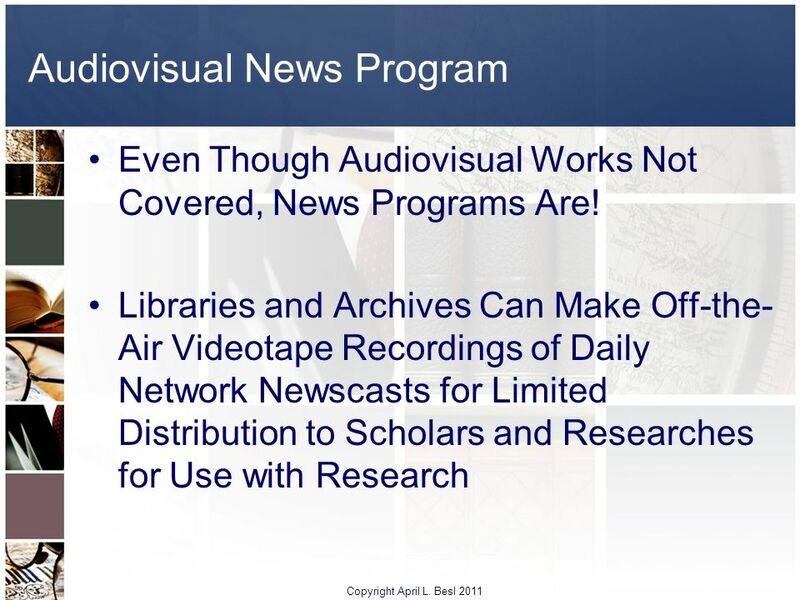 2 Agenda Copyright April L. Besl 2011 When Is A Work Protectable? 7 What is Not Protectable? 8 What Else is Not Protectable? 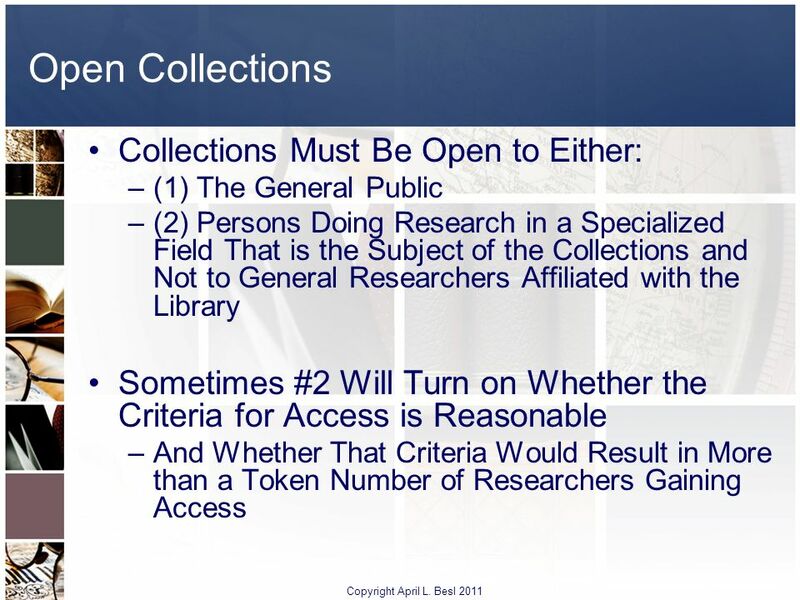 9 But What About Research? 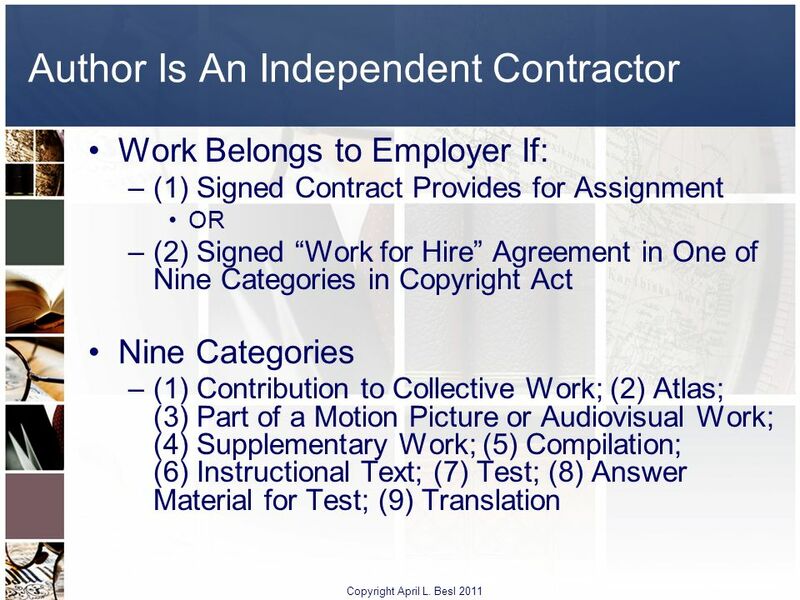 10 Agenda Copyright April L. Besl 2011 When Is A Work Protectable? 12 What is a Derivative Work? 14 What About Live Musical Performances? 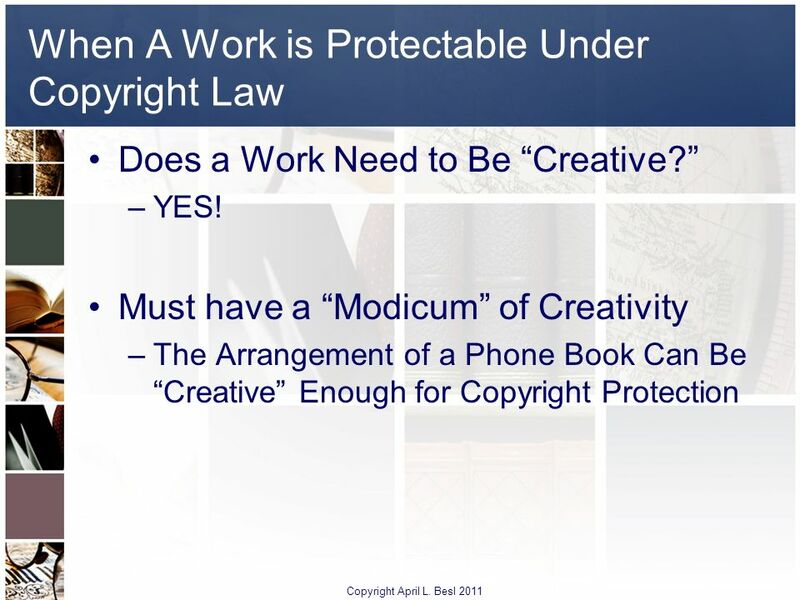 17 Agenda Copyright April L. Besl 2011 When Is A Work Protectable? 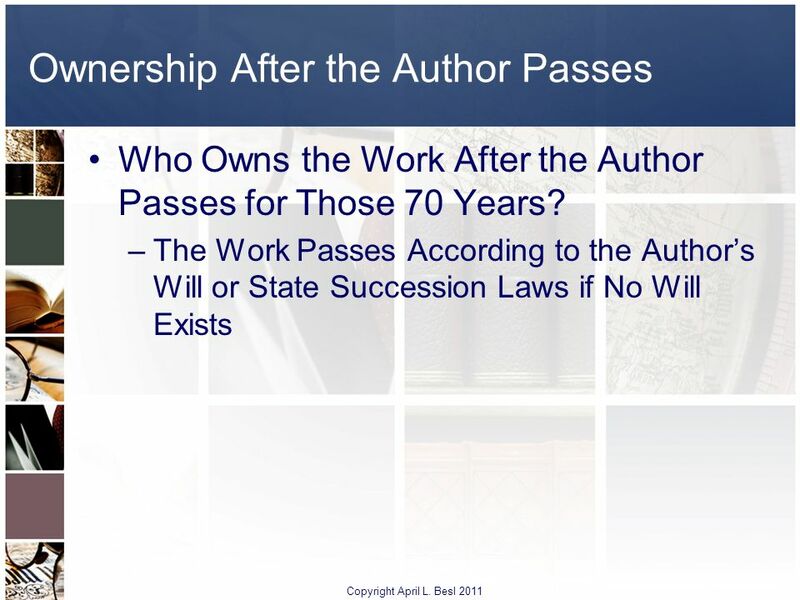 20 “Joint Authorship” Who Owns What in Joint Authorship? 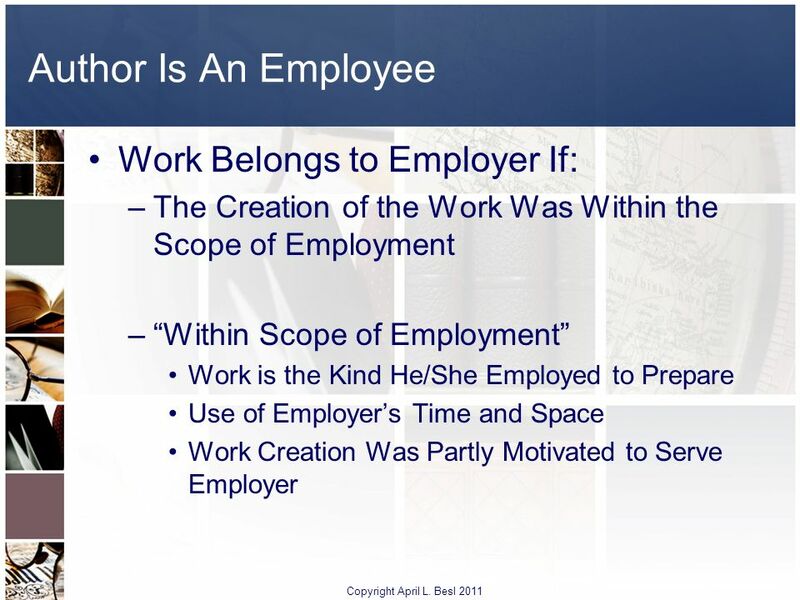 25 What if the Author is a Government Employee? 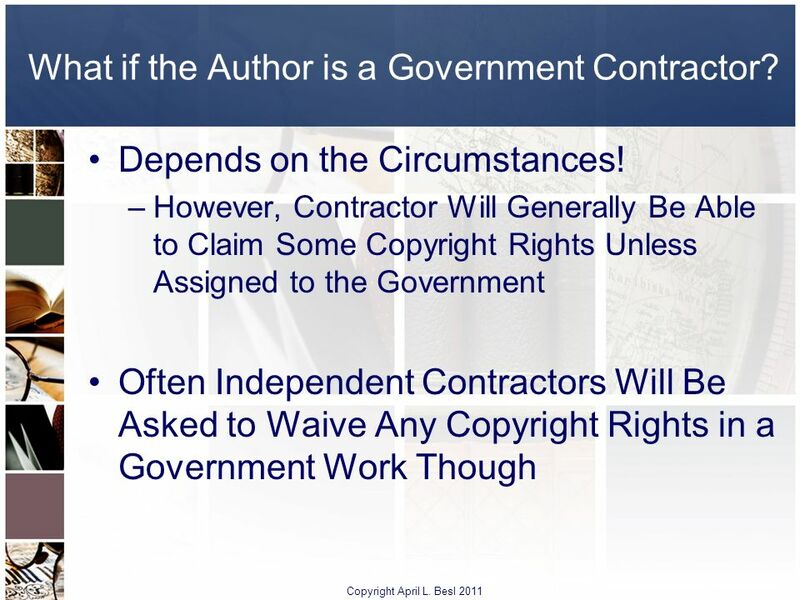 26 What if the Author is a Government Contractor? 27 Agenda Copyright April L. Besl 2011 When Is A Work Protectable? 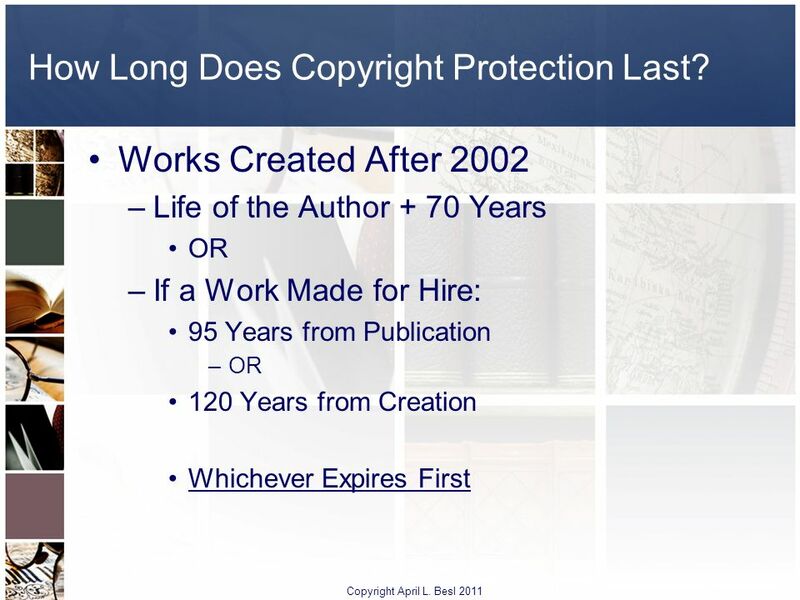 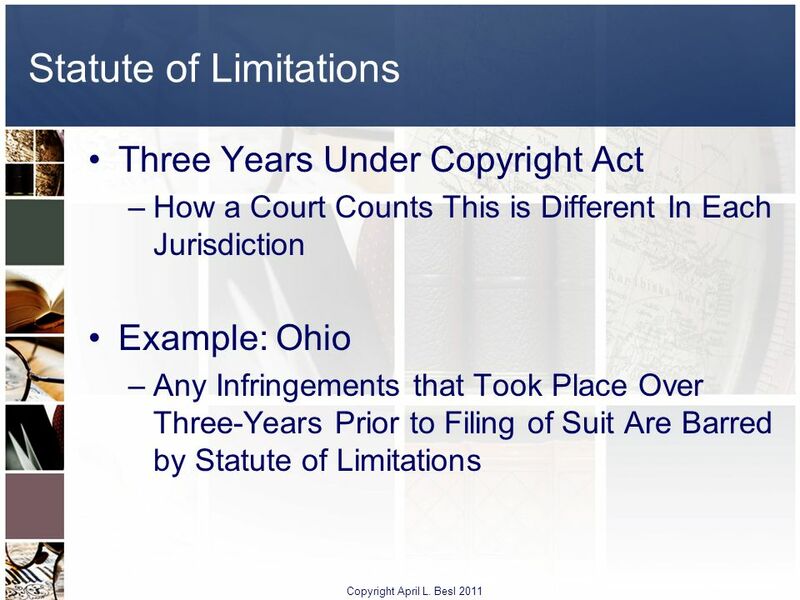 29 How Long Does Copyright Protection Last? 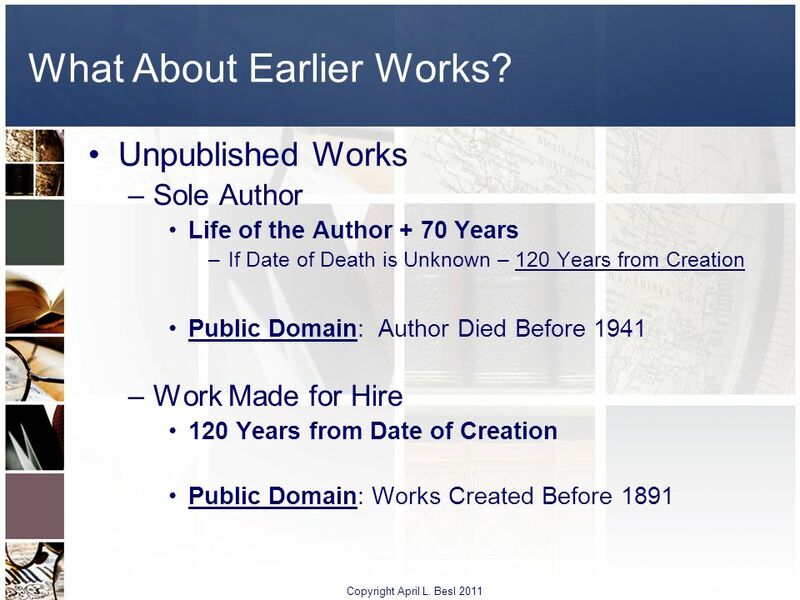 30 What About Earlier Works? 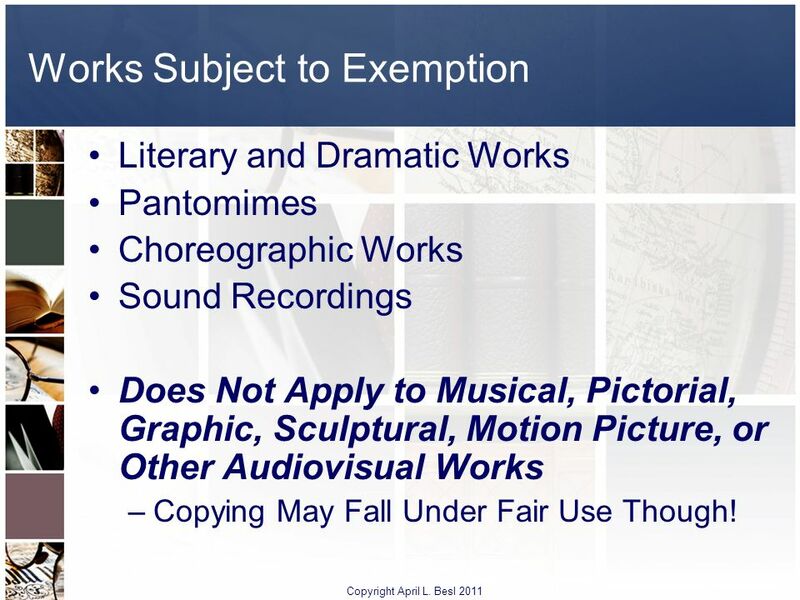 31 What About Earlier Works? 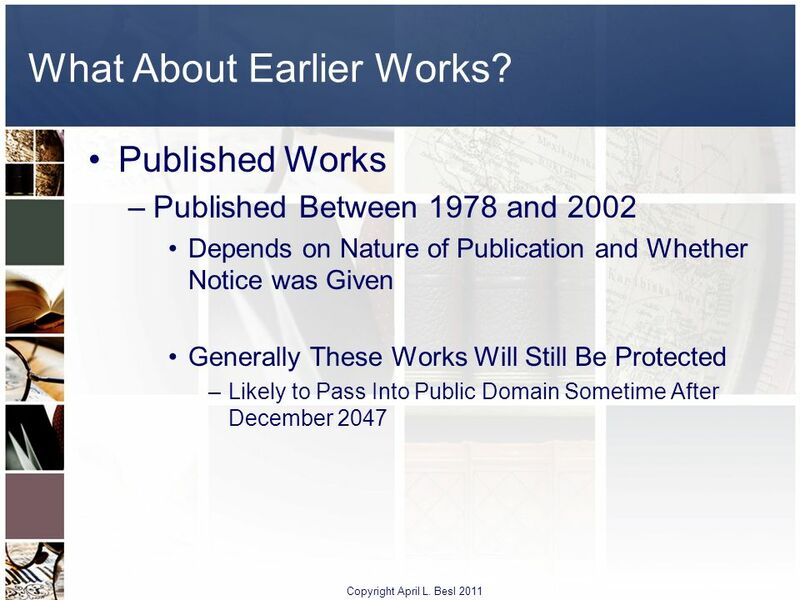 32 What About Earlier Works? 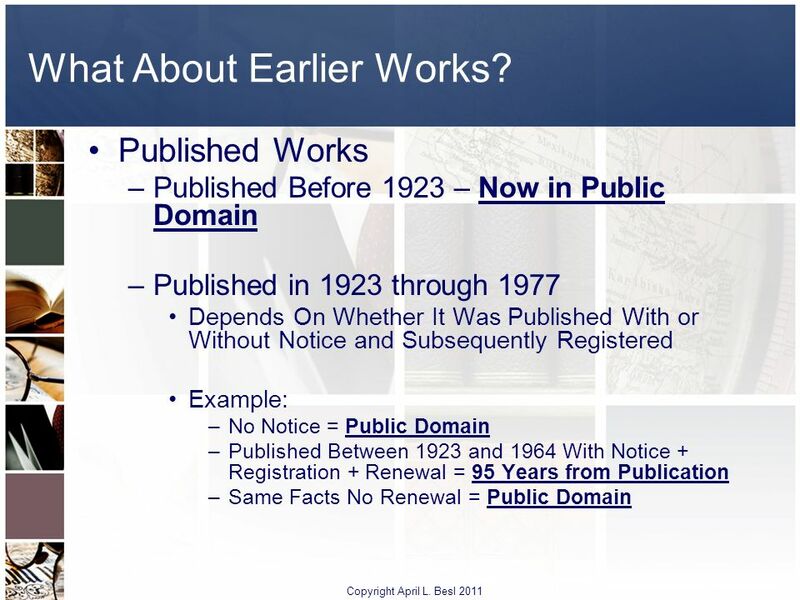 33 What About Earlier Works? 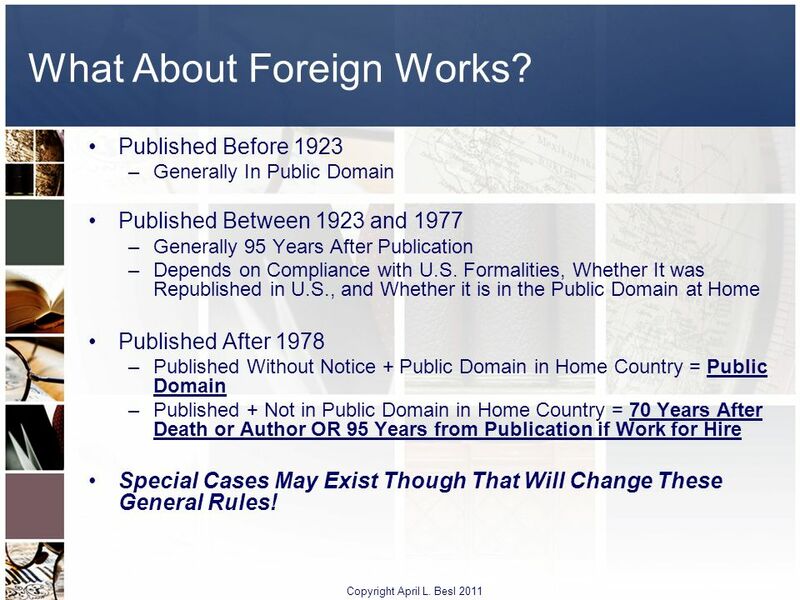 34 What About Foreign Works? 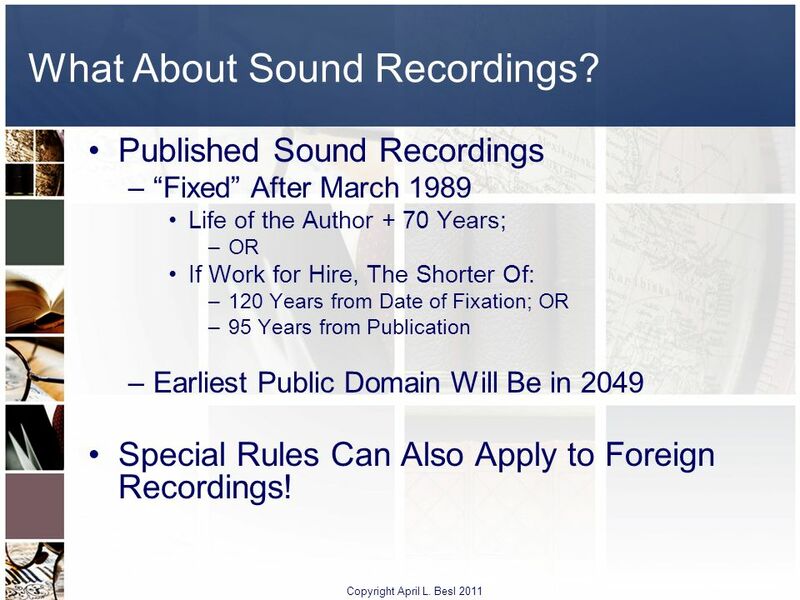 35 What About Sound Recordings? 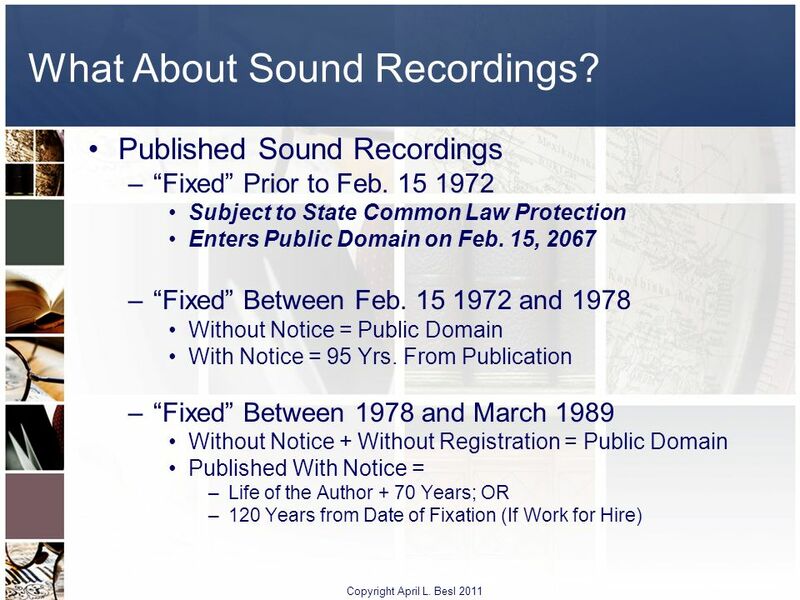 36 What About Sound Recordings? 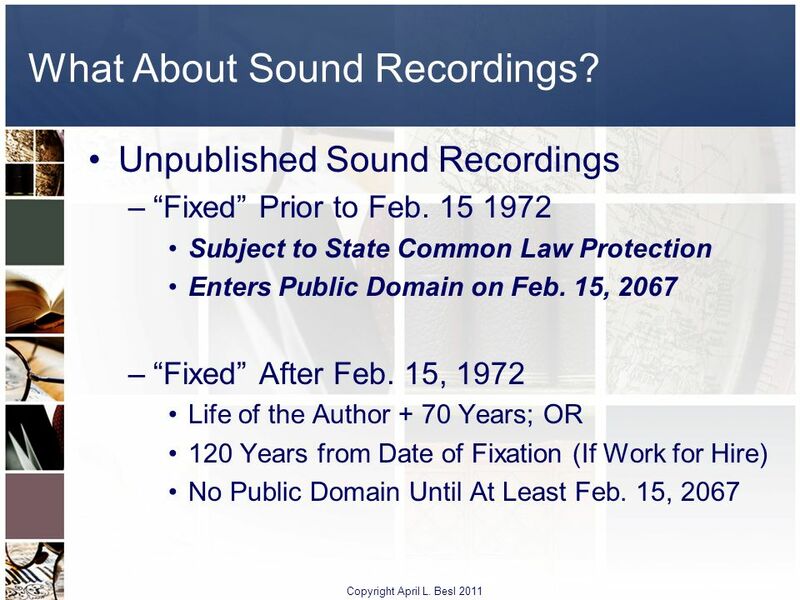 37 What About Sound Recordings? 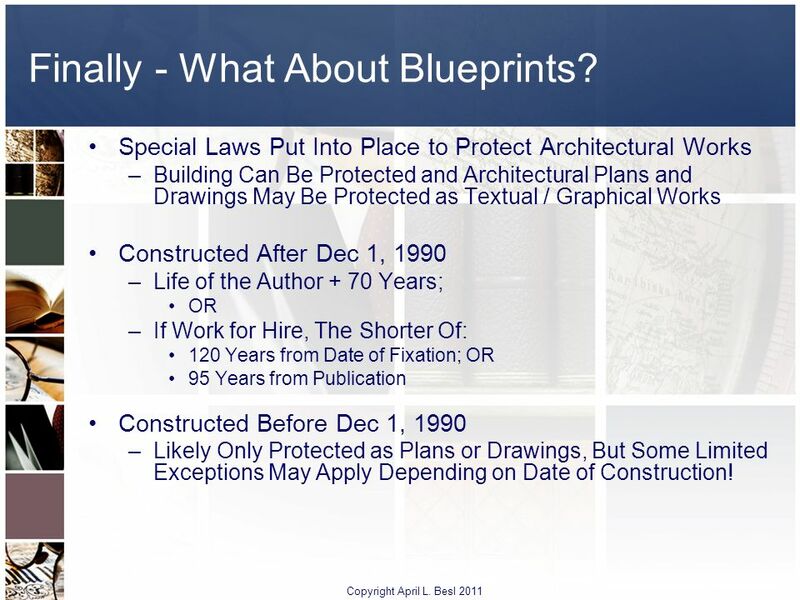 38 Finally - What About Blueprints? 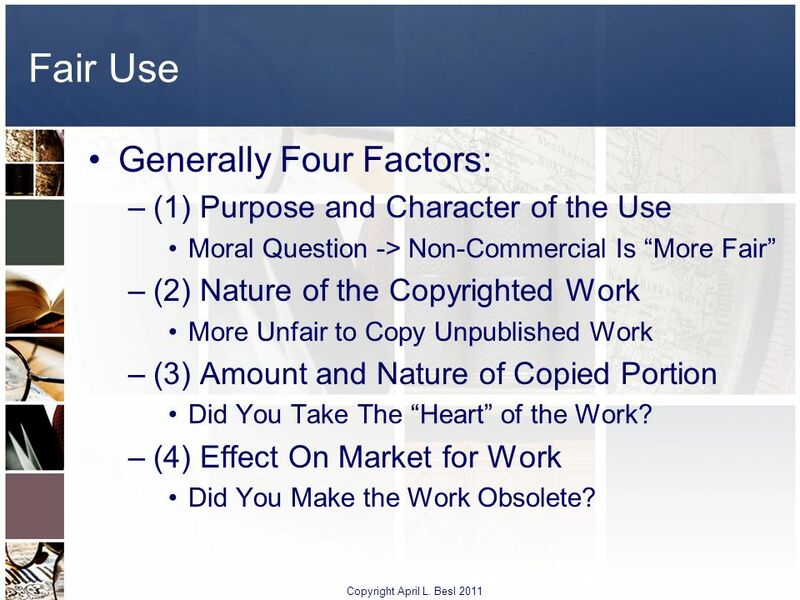 40 Agenda Copyright April L. Besl 2011 When Is A Work Protectable? 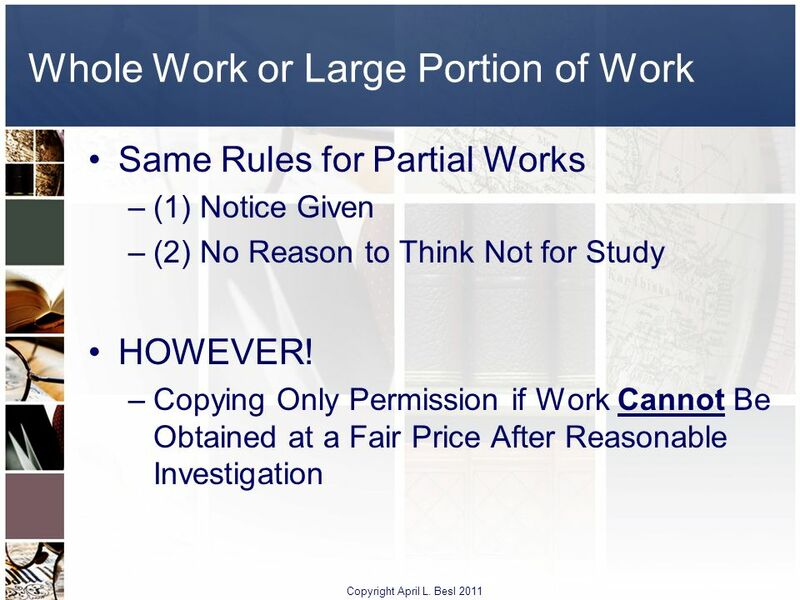 43 Agenda Copyright April L. Besl 2011 When Is A Work Protectable? 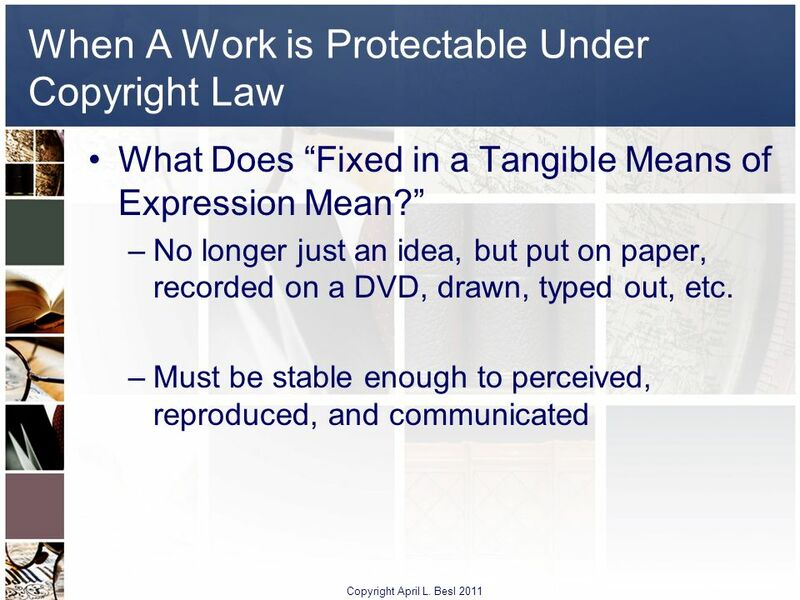 49 Agenda Copyright April L. Besl 2011 When Is A Work Protectable? 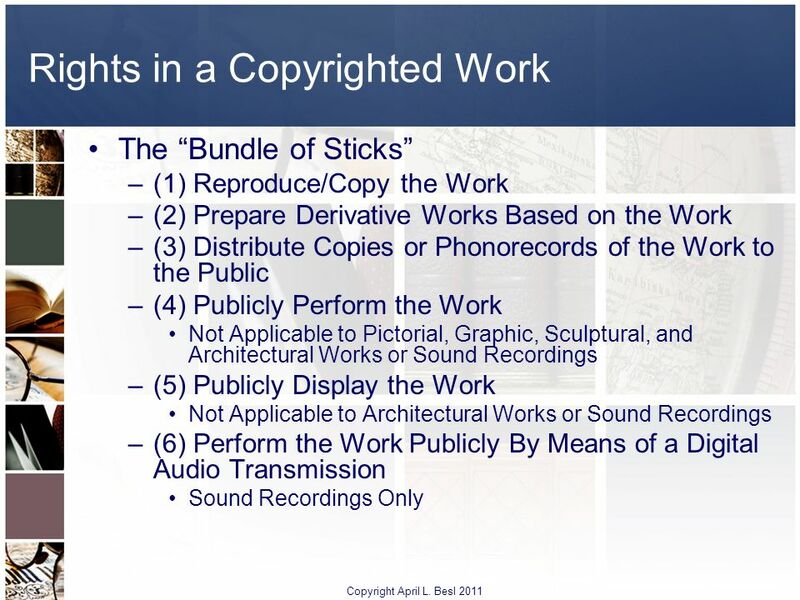 65 Agenda Copyright April L. Besl 2011 When Is A Work Protectable? 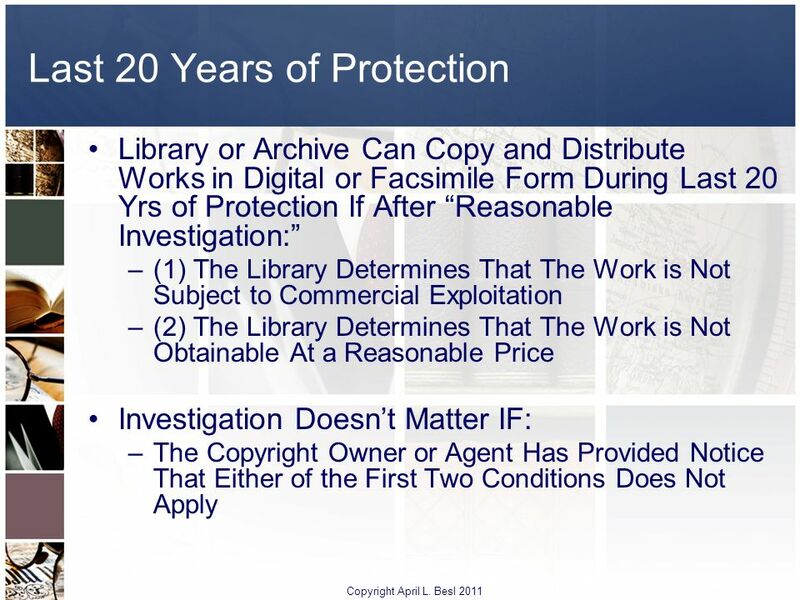 72 Agenda Copyright April L. Besl 2011 When Is A Work Protectable? 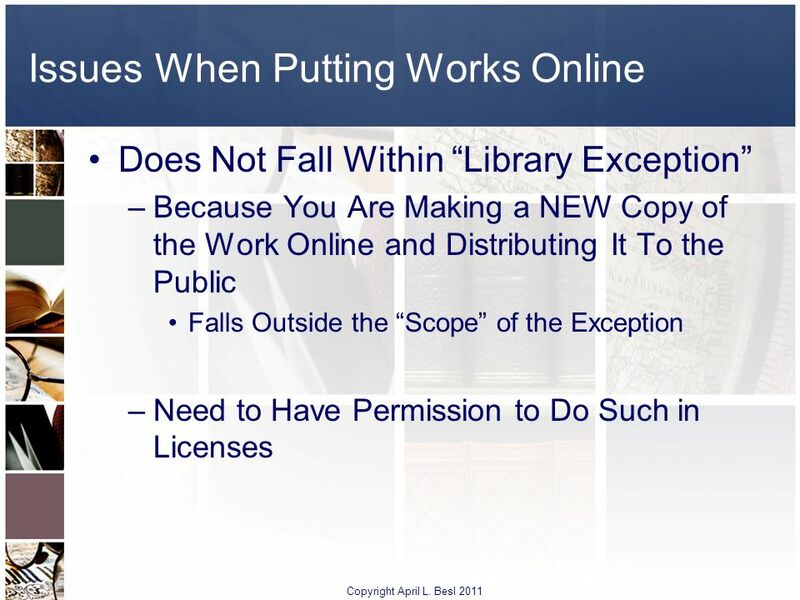 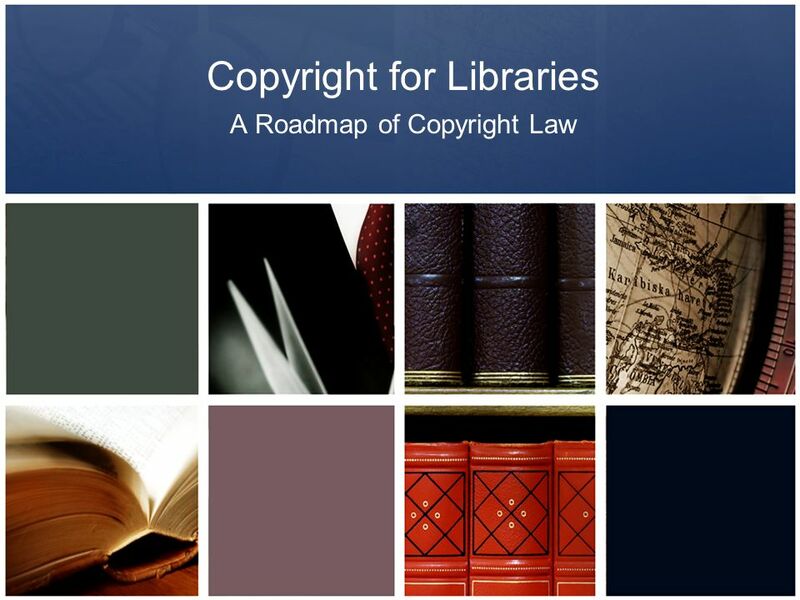 Download ppt "Copyright for Libraries"
COPYRIGHT AND COPYWRONG Respect Copyright, Celebrate Creativity. 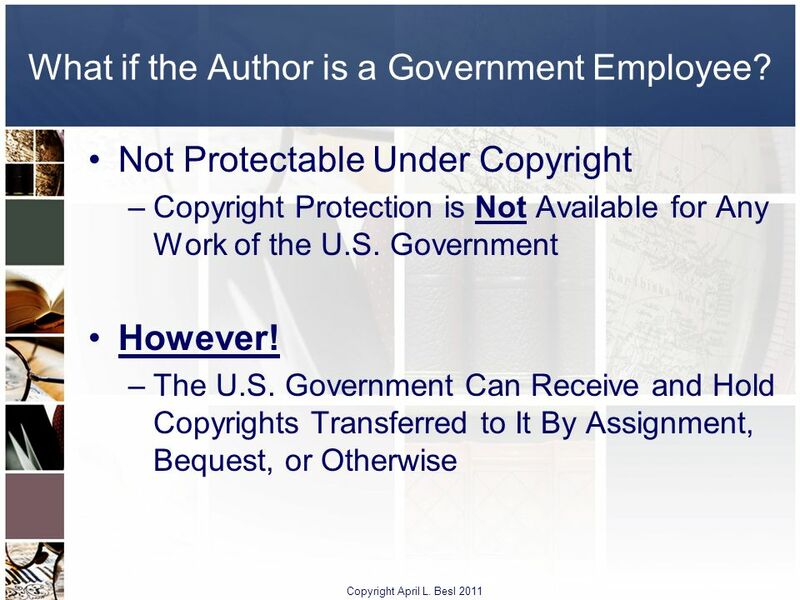 Copyright Law & Fair Use Rights Sponsored by the Intellectual Freedom Committee VLA Annual Conference Friday, October 26, 2012; 3:15–4:00 p.m.
Introduction to Copyright Principles © 2005 Patricia L. Bellia. 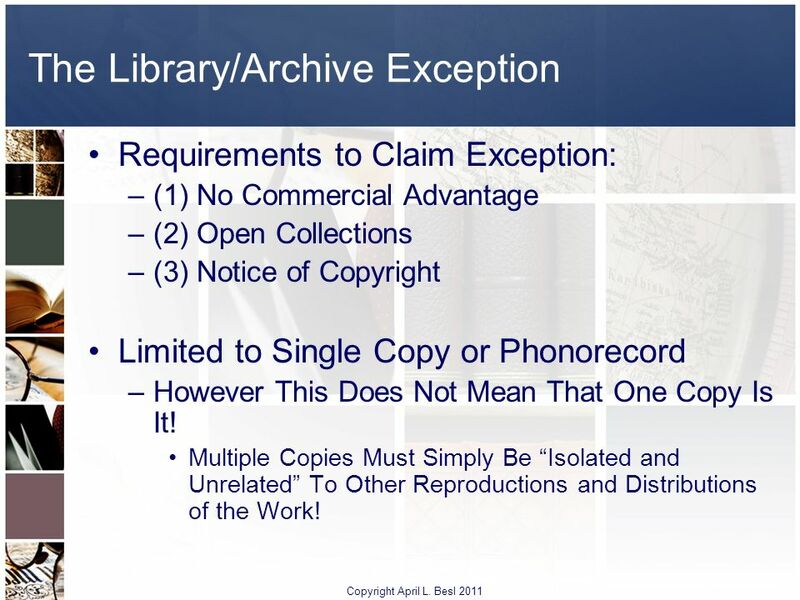 May be reproduced, distributed or adapted for educational purposes only. 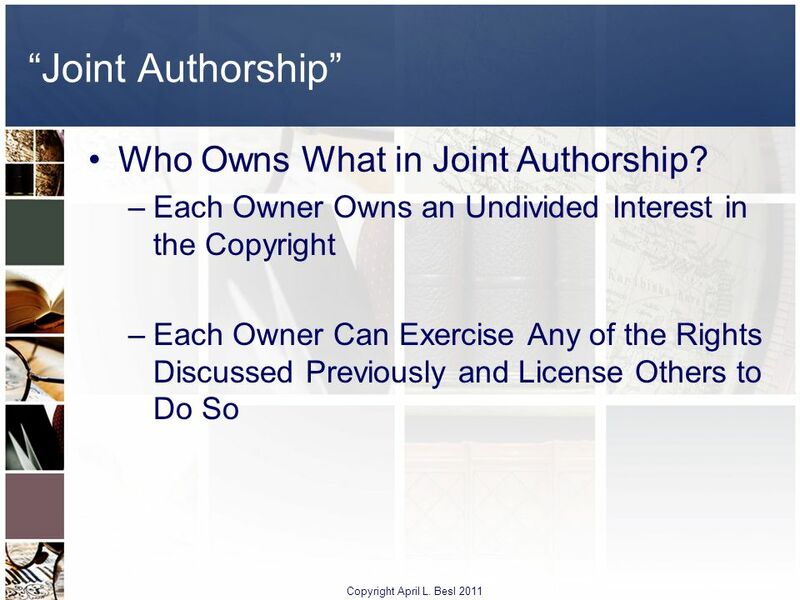 1 COPYRIGHT AND FAIR USE Blackboard System Admin Group June 26, 2007. Copyright and Fair Use Dan Lee Interim Team Leader for Undergraduate Services and Copyright Librarian March 21, 2007. US Copyright and Intellectual Property Issues Carol Green. Intellectual Property UCLA DIS “Information Ecology” C.Hoda,Fall 2008. 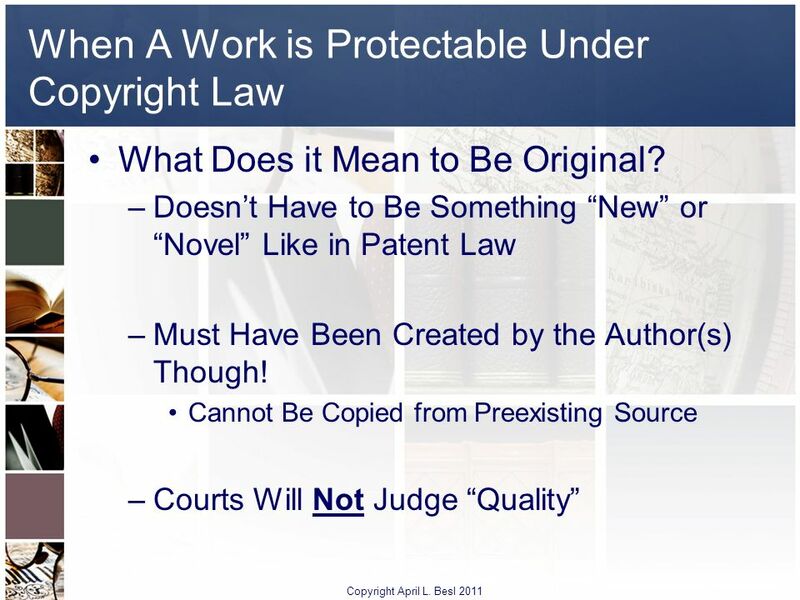 Chapter 7.5 Intellectual Property Content, Law and Practice. 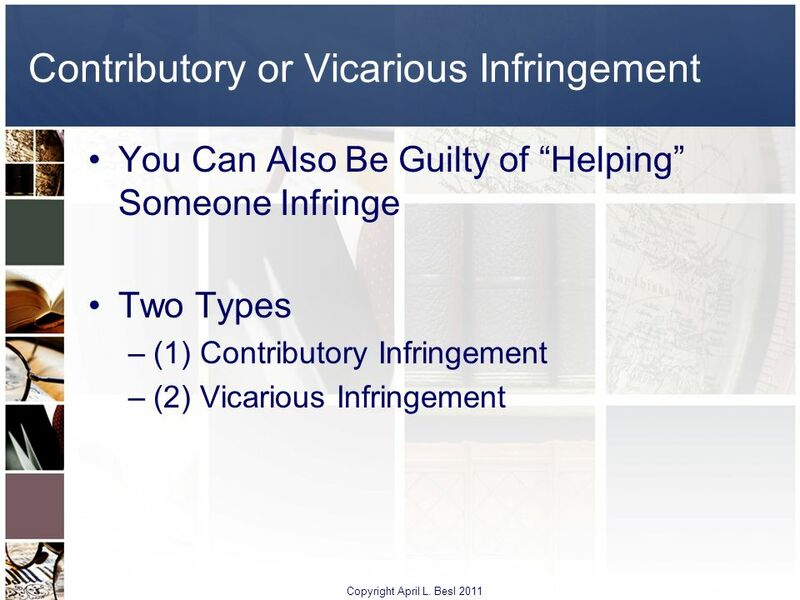 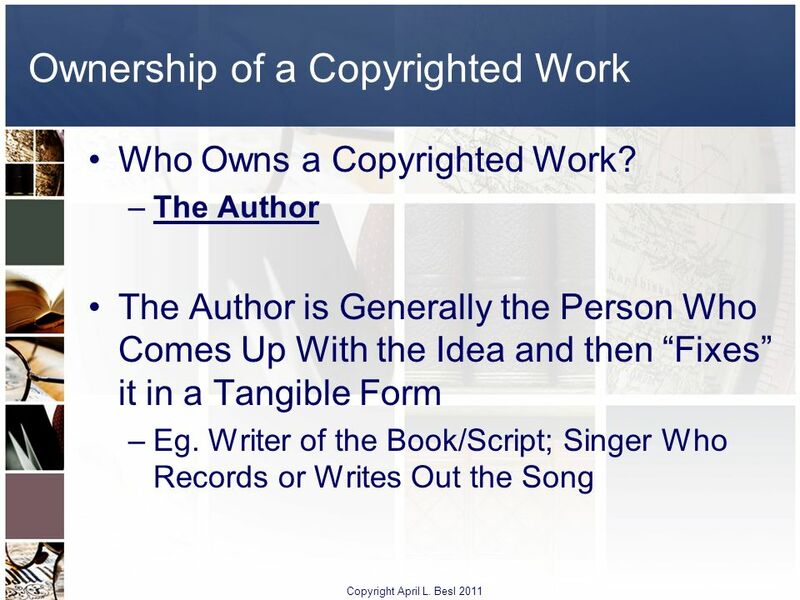 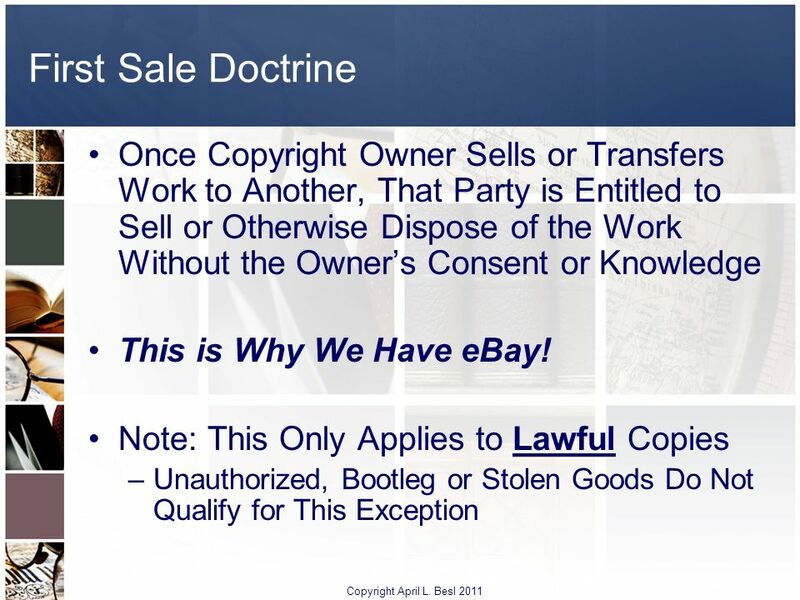 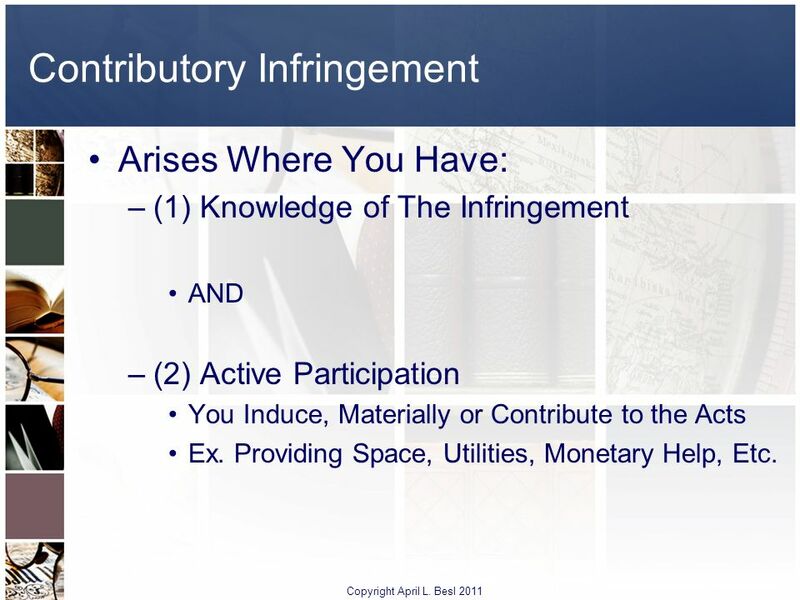 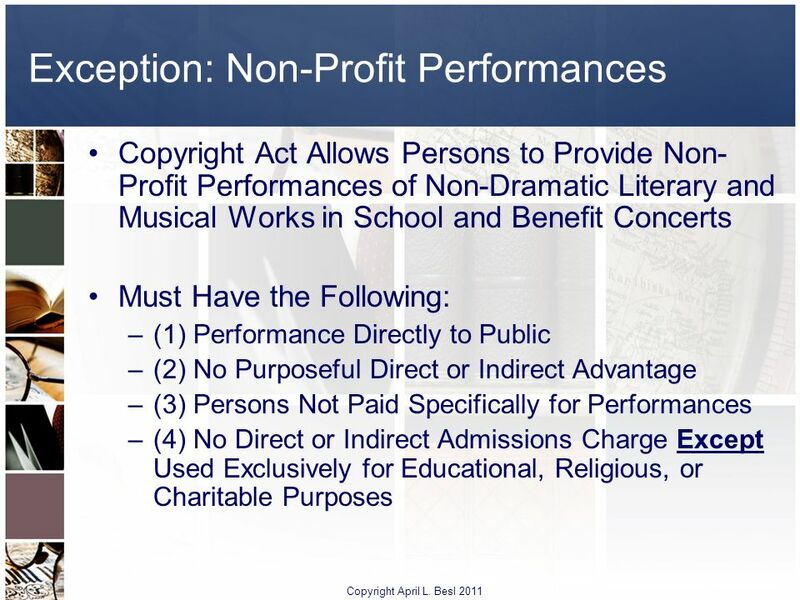 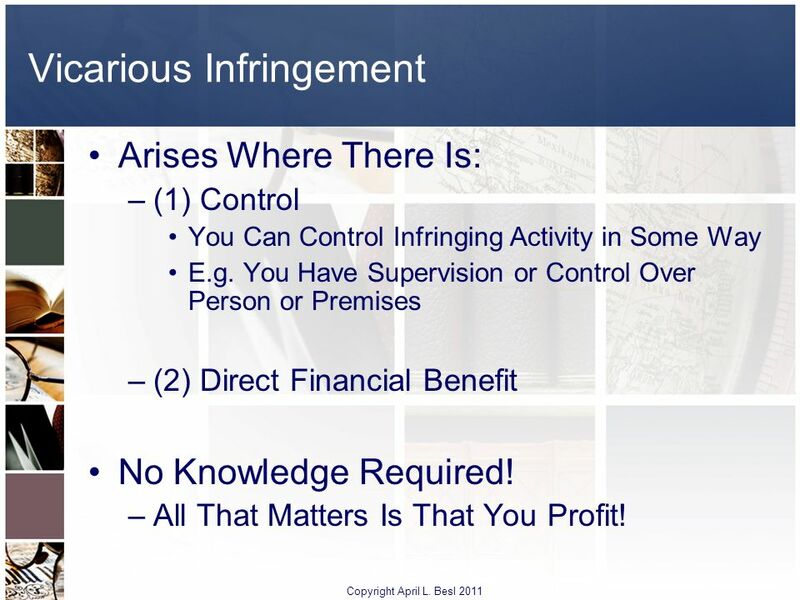 The Music Business – Part 3 Copyright Basics Presented by: Debra J. Fickler, Esq. 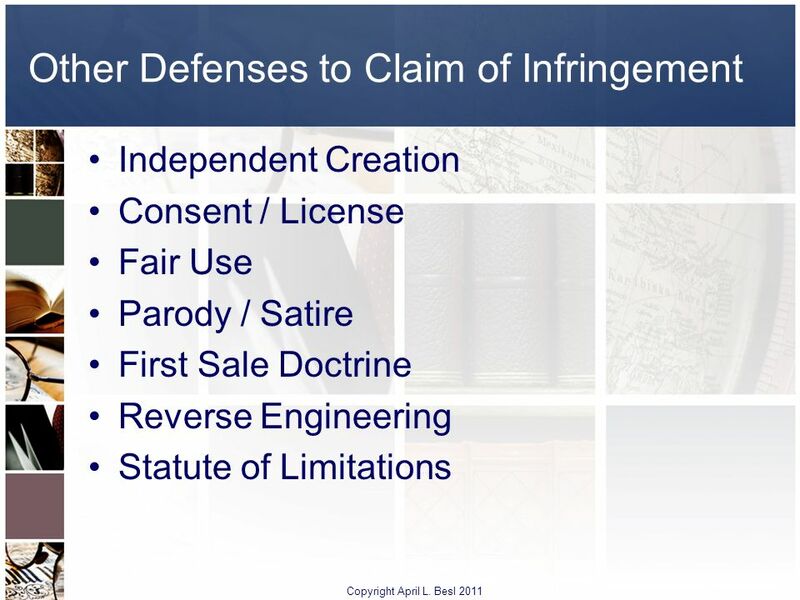 © 2002 Steven J. McDonald What do these have in common? 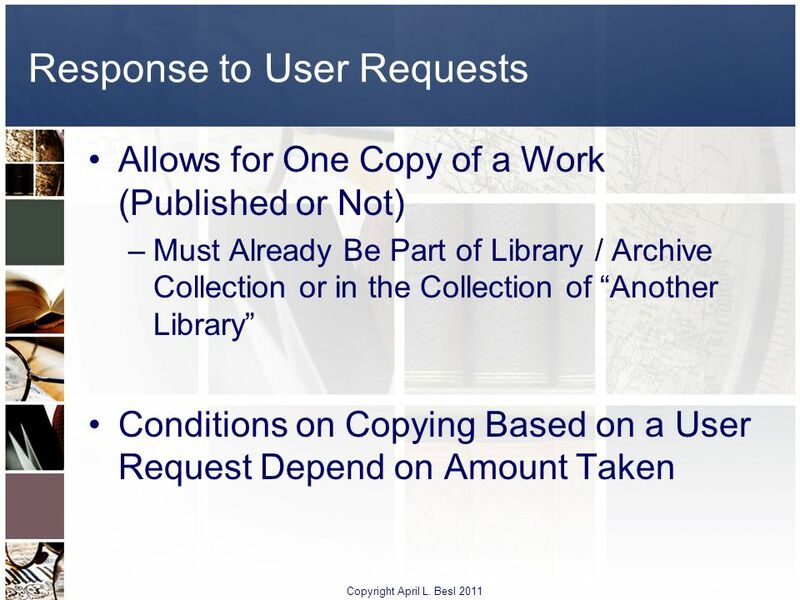 The Mona Lisa The Starr report What I am saying Your idea for a web page The Wexner Center for. 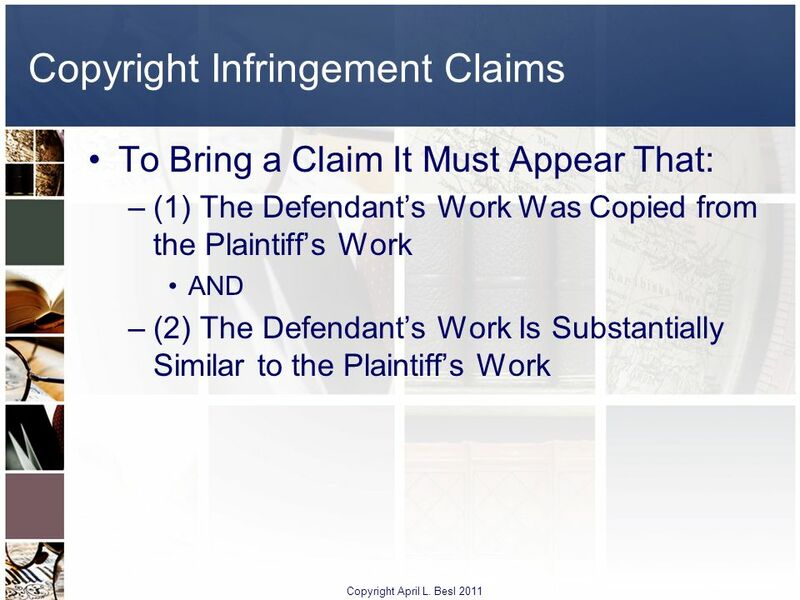 Intellectual Property Boston College Law School January 18, 2008 Copyright – Ownership, Duration. 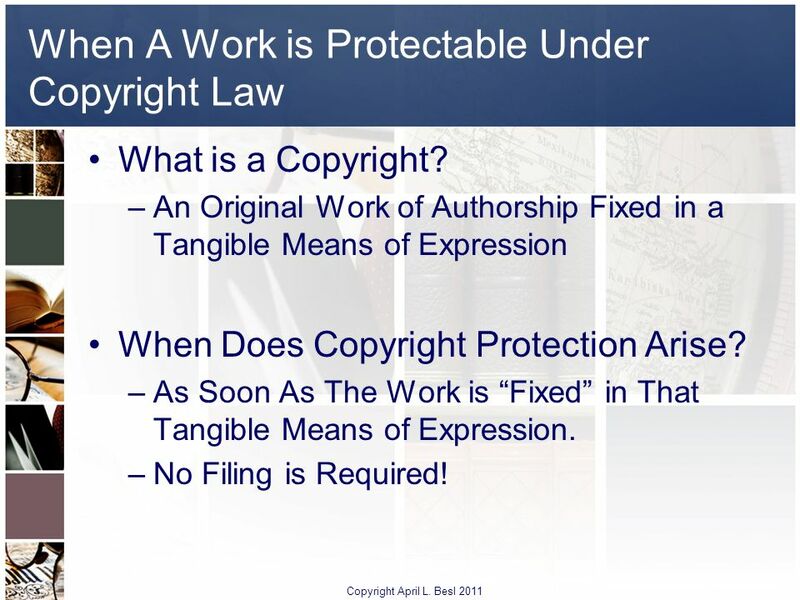 Copyright: Protecting Your Rights at Home and Abroad Michael S. Shapiro Attorney-Advisor United States Patent and Trademark Office.